Dancers from the McLaughlin School, Glasgow. 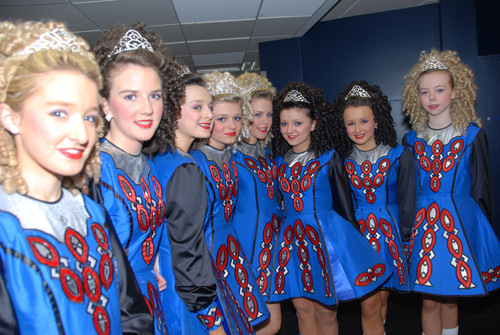 Glasgow was taken over by trophies and treble reels this weekend, as the Scottish qualifiers for the World Irish Dancing Championship took place. The preliminary competition was held at The Cooper Institute in Clarkston, beginning Friday and concluding with a final Winners Parade on Sunday evening. Participants were competing to earn a place at next year’s World Championship, which will be held in Philadelphia. It will be the first time since the event began in 1970 that it will take place outside the UK. Glasgow hosted the Championship in April of last year. The event also raised money for pupils of Holyrood Secondary School, who are travelling to Malawi next year to build classrooms and a teaching area for African children with special needs. Posted in Entertainment, Sports and tagged Championship, Clarkston, Glasgow, Irish Dancing. Bookmark the permalink.